Companies, who sent mass emails will benefit from our bulk email verification service. Just add the list of addresses you need to check and get results! deliverability guarantee. We have developed an email verification tool that can make your email list nearly perfect. checks for new users. Try our verification tool and become our loyal client. per check. An Affordable service for every email marketer. 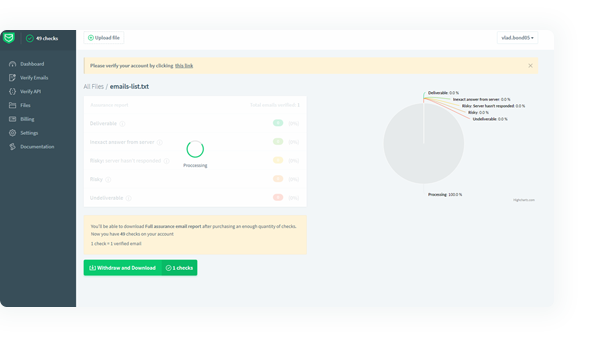 bulk email validation and get access to API. 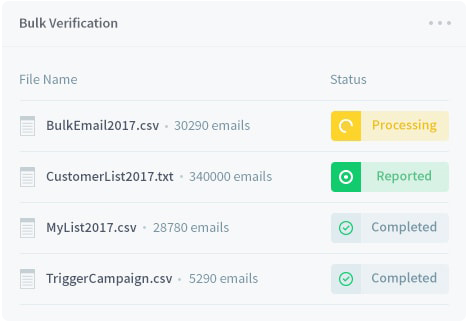 Analyze the reviews our email validation tool provides you with to sort of the invalid addresses and enhance your campaign. check. We offer 500 free checks for all new customers. Need more? If you handle a huge lists of email addresses, please contact us for special rates. Does it require any app or program installed? You can use our web service without any apps or programs on your PC. Bulk email verification is done online via our servers, so your IP reputation is safe as well. All you need is to upload the email list and download the results. What number of addresses can be processed by your bulk email checker at a time? There are no any restrictions on how many emails can be checked. The only limit is your pricing rate. 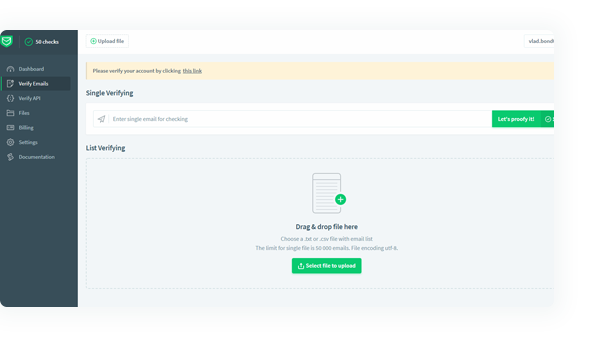 So you can upload a file with the exact amount of emails you need and get the clean list for your marketing goals. Do I need any special skills to use your email validation service? 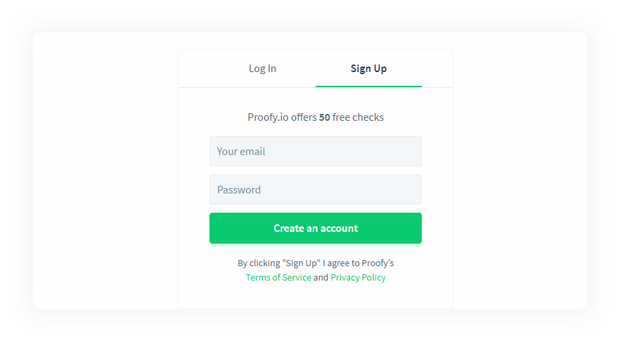 Any person who is aware of basic computer and internet features can validate email lists with Proofy. The checking algorithms do all the work. Your job here is to upload the “dirty” list and soon get the “clean” one. What format of email list file does your service recognize? For now you can use files in .csv format. That is how our online bulk email verifier works. If your email list is stored in a file in another format, please, convert it to the specified one. Write to our managers and we will contact you as soon as possible in order to solve any issue you have.